A powerful 20hp motor drives spindle speeds to 5000 rpm on this horizontal lathe from Hardinge. The A2-6” main spindle handles bar stock up to 2” in diameter, with 12.3” maximum turning diameter on parts up to 25.5” long. Comes standard with a 12 station turret that holds up to 24 tools; interfaces for through-tool coolant, bar feeds and chip conveyors; machine crash protection; PCMCIA memory card; USB; rigid tapping and much more. 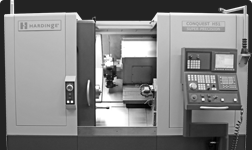 Versatile horizontal lathe with many standard features.